For fans of fine furniture in the lovely mission style, the Amish Cranbrook Mission Bench is the solid wood bench for your collection. The design of this mission bench stands out as mission furniture uses no embellishments or fussy decorations. The back of this mission bench is the epitome of grace and beauty for your American home furniture collection. Extra wide back slats are accentuated by slender ones that curve to meet your back with all the support you need for a comfy sit. 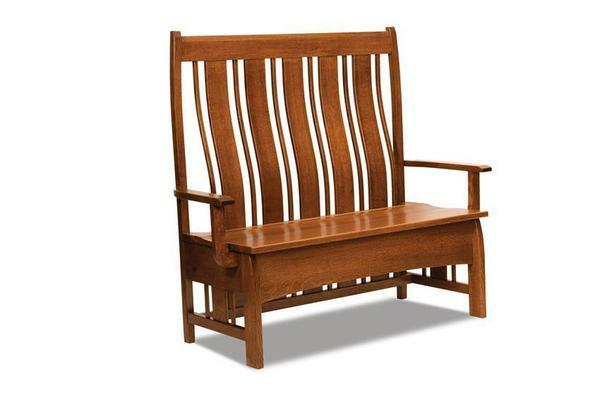 Display warmth and invitation in your front entryway, hallway or foyer with the Cranbrook Mission Bench. Amish furniture offers function in addition to lovely form and this mission bench is no exception. The Cranbrook seat opens to provide you with storage perfect for books, sweaters, blankets, shoes and more.